As a child, Edgar grew up in the family home of Park House, a large property just off the High Street in Thornbury. The 1901 census shows that Edgar and his younger brother Mervyn Bruce were boarders at Wellington College in Shropshire. Edgar enjoyed his time at Wellington and ended up as Captain of Cricket, Head Prefect and Committee member of football, Photography, Cycling and Golf. We know from Edgar’s notes that he had a go at most sports. At Wellington College, he participated in gymnastics, specialising at the parallel bars, and dancing where the ‘Sword Dance’ was his particular favourite. He admitted to ‘never being any good at athletics or swimming and could not stay in the bath long enough, turning blue or white with the cold’. At football he ‘started as goal-keeper but found this too cold for my liking and afterwards secured my place and colours in the XI at left outside or right back’. He played golf fairly regularly at the 9 hole course at Lower Hazel and managed to achieve a handicap of 6 on that course, but acknowledged that he would not be as good as that on other courses. He had been runner up in a tournament at Wellington College but had lost his ball in the final. He enjoyed tennis, although admitted that he had to use two hands on his backhand strokes which was not approved of at that time. He reached the final of a Freshman’s Tournament in Cambridge but lost because ‘using both hands was practically forbidden’. He enjoyed a great deal of tennis on his court at Park House and he played a few games on the indoor court at Thornbury Castle. Apart from cricket (referred to below) Edgar’s favourite sport was hunting and riding, which started with his little donkey ‘Arabella’. He enjoyed ice-skating and tobogganing and recalls one night on Marlwood Hill when they had to duck because they passed right under a cow which had strayed across their path. He went on to study at Christ Church College, Cambridge where he achieved first B.A., and was involved with cricket, soccer, hockey, golf, cycling, tennis and billiards. When commandeered to join the Rowing Club, he ‘rocked the boat so badly’ he was not required to row again. These distractions may have been the reason why his medical studies lagged behind and he was required to spend another year at Cambridge before joining St Barts Hospital, London. The 1911 census shows Edgar had decided to follow in his father’s footsteps. He was a medical student living at 23b Golders Green, London. Edgar qualified as M.R.C.S. England and L.R.C.P. London in 1913. His first appointment was at the Royal Waterloo Hospital for Women and Children in 1914. He was made a Junior Resident Medical Officer but after two months his boss retired and Edgar was promoted. Edgar’s ambition was to become a Ship’s surgeon and see the world for a year before returning to buy back his father’s practice in Thornbury (which had been sold to a Dr Duffet following Edward’s death. The outbreak of the War changed these plans and he was advised by friends in Thornbury to get married and return to Thornbury. In 1914, Edgar married Hilda Henrietta Heathcote. Hilda had been born on 4th May 1893. They must have settled in Thornbury as their first son, Edward Mills Grace was born there on 5th June 1915. They had two more children: Cicley born on 22nd April 1918 and Gerald Frederick in 1921. We know from the audio tape of an interview with Edgar’s niece, Sally Gordon, that Edgar lived in Pullins Green after he got married in 1914. Edgar also mentioned that they had moved to the house known as Porlock Weir in his notes. ‘Porlock Weir’ was the name of the house now called 3 Pullins Green. Edgar Mervyn Grace served with the Royal Army Medical Corps in WWI. We are grateful to Owen Dobson for sending us photographs of the medals that Edgar earned in that conflict. Two small versions of these photographs appear below. Please click on them for slightly larger images. During the early part of the War, Edgar was building up his father’s business in Thornbury which he had bought back from Dr Duffet. On 23rd April 1917 Edgar Mervyn Grace applied for exemption from military service giving his address as ‘Porlock Weir’ Thornbury. The basis of his application was that it was necessary to maintain service to 450 panel patients, also “private reasons which would entail considerable loss and inconvenience if I were to be called up”. He must have been granted a temporary reprieve as it wasn’t until 27th January 1918 that he joined the R.A.M.C. According to Edgar’s notes, ‘after a week or two at Millbank’ was sent to Blackpool where I received my inoculations, and so say taught horse-riding on the sands. Never having ridden without a saddle or stirrups before, though I had hunted with hounds since I was eight I found the going difficult and was not helped by being allotted a huge black Belgian funeral horse and accused of going to my own funeral. After a fortnight in charge of the Hospital and nearly losing my life in the training in the gas chamber owing to the clamp on my nose coming adrift I was posted to France and having had my photo taken at Folkestone had a fairly calm journey from Dover to Boulogne, then by train with open or no windows or lights in heavy snow to le Flavy to joining the 42nd Field Ambulance. ….. I was posted to Noyon just north of Paris and was there when the Bosch attacked at Peronne. I was then in charge of a ward of Italians who when they heard the firing getting closer, absconded in their bedclothes and being severely wounded or ill, fell by the wayside. My ambulance had spent that night in Noyon and was hit by a direct bomb killing several men and good horses. Later I was ordered to rejoin my ambulance who had already retreated northwards and was heavily bombed at a busy crossroad where traffic was stationary and it seemed ages before we could proceed. Eventually I caught them up and we retreated 180 miles in a fortnight (wearing the soles off my favourite riding boots) to Amiens where the Germans were piercing the roof of their lovely Cathedral with their shells. Here I received the news of the birth of my daughter, Cicely on April 22nd 1918, nine pounds- and soon after I went down with P.U.O. and sent to Hospital at Le Touquet. We were in the Casino, a glass palace, and had the wind up when a Tommy lit a cigarette in the night with Bosch planes overhead, the light flashing from glass to glass, a perfect target. I was then dispatched by stretcher and ambulance to Calais, thence to Dover a very rough passage, and on by train to Bristol to spend my convalescence at Streatham Hall near Exeter. After brief spell at home I was stricken with a very severe bout of jaundice and moved to Southmead Hospital where I had a narrow escape of having my gall bladder removed and was sent to Park Wern, Swansea for further convalescence. ………I was then sent to Ashton Court to be nearer home as I had developed D. A. H. and was there when Armistice was declared. On my recovery I was posted to Tidworth and promoted to Captain R.A.M.C. ‘. Edgar and Hilda were listed as living in Porlock Weir in the 1918 electoral register. On his discharge in 1919 the family seem to be living at Close House but very soon he was able to buy back Park House at auction. This had been his parent’s home up to his father’s death in 1911 when it had to be sold to pay off the mortgage. The 1921 electoral register shows Edgar and his wife, Hilda Henrietta living there with his stepmother, Sarah Elizabeth. They carried on living there until Sarah Elizabeth died in 1932. Edgar also had his surgery there. The photograph of Hilda was taken in 1932 at the 21st birthday party of her niece, Sally Grace. Like all the other members of Grace family, Edgar was a very good cricketer in his own right. The Cricinfo website tells us that he made his first appearance for the Thornbury Club at the age of nine when he came on as a substitute against Cinderford and took six wickets for 24 runs with innocent-looking lobs. He went on to become Captain of Thornbury for 37 years and altogether served the club for 79 years. In 1920, his best season, he scored well over 1000 runs and took 146 wickets for only seven runs each. Edgar also played for Gloucestershire Gypsies from 1930 to 1933. Edgar and Hilda carried on living in Park House and Edgar also had his surgery there. Finally in the late 1950’s they moved from Park House to their new home at Hilltop in Alveston. Edgar died on 24th November 1974 and Hilda died on 27th January 1983. Molly Cotter the daughter of the vicar in the 1920’s remembers Mrs Grace very well. She said that the Thornbury “gentry” felt that Edgar had married beneath him. However Molly recalls that Mrs Grace was a very pleasant and kind lady who took her to Bristol to see the Great Anna Pavlova dance the Dying Swan in her final tour of the country before her retirement. 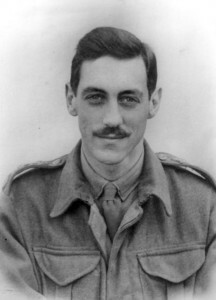 Edward Mills Grace – born on 5th June 1915 and named after his grandfather. ‘Ted’ was educated at Avondale Prep School in Clifton and then at his father’s old school, now called Wrekin College, Shropshire, from September 1929 to February 1933. He then qualified at Bristol University in 1939. He then took up a house appointment at Bristol Royal Infirmary. Before the War he had been a member of the Bristol University Officer’s Training Corps and in May 1940 he was commissioned into the R. A. M. C. During his first week he was loaned out to the Royal Navy and helped bring back the wounded from the beaches of Dunkirk. He made four crossing on the HMS Halcyon. From June 1940 to January 1944 Ted served as R. M. O. to a Medium (Surrey and Sussex Yeomanry) Regiment of Royal Artillery. Initially he served in this country, but later with the First Army in North Africa and then with the Central Mediterranean Force in Italy. Whilst here Edward wrote a treatise on ‘Gentian Violet’ and joined another surgeon in trying to invent an ear plug. In January 1942 he also married Rosemary Garner at St Georges Church, Wrotham in Kent. Rosemary was eldest daughter of Sydney Garner of the Old Palace, Wrotham and great grand-daughter of Sir Benjamin Stone M. P. and Sir Edward Holden M. P. At the time of the marriage Rosemary was clerk to the local detachment of Home Guard. In January 1944 he had just achieved his ambition and was giving anaesthetics and looking after surgical beds in a general hospital in Italy. Tragically, Ted caught typhoid fever whilst in Italy and he died on 14th March 1944 aged 28. He was buried in Bari. His obituary printed in the Gazette in April 1944 tells us a lot about Ted. He played cricket for Thornbury, Bristol University and The Gloucestershire Gypsies, being a brilliant fielder at forward short leg and extra cover, batting and bowling left handed. He had many other sporting achievements. At tennis he used his great height to produce a devastating service. He held the University Cup for hurdling and distinguished himself in the high jump and shooting competitions with the B. N. A. F. He was always keen on hunting and enjoyed outings with the Berkeley Hounds. He was also keen on music, dancing and photography and exploring churches and old buildings. The ‘Cricinfo’ cricketing website also added that he was ‘A useful cricketer, left-handed with both bat and ball, he played for Wrekin College and Bristol University, for whom he did well in a good innings of 96 against Birmingham University. In 1935, when a substitute for Worcestershire Gentlemen against Gloucestershire Gipsies, a club of which his father, Dr. Edgar Mervyn Grace, was captain, he made 82 not out at Cirencester, and in recognition was elected a member of the club! In build he resembled his illustrious grand-uncle W. G. Grace, and fielded finely close to the wicket – a characteristic of his grandfather as described in The Cricketer’. Dr Edward Mills Grace junior – Teddy, grandson of the famous E.M. was a good club all-rounder, being a marvellous fielder, who batted and bowled left-handed. He was very long in the legs and six foot five inches tall, and being athletic excelled in the hurdles. His fielding close-in at short-leg was so consistently brilliant as to recall similar feats by his grandfather at point, where he had no equal. Like E. M. who made 192 not out when playing as a substitute for M.C.C. v Kent in 1862, Teddy, having been lent to Worcestershire Gentlemen in their game with the Gloucestershire Gypsies 73 years later, distinguished himself by hitting up a grand 82 not out and was immediately elected a member of the Gypsies! He also scored 96 for Bristol University in their annual match with Birmingham University. Like his father, Dr Edgar Grace in the first War, Teddy served as a Captain in the R.A.M.C. at the start of the second War. He was commissioned in 1940 and during his first week helped to bring back the wounded from Dunkirk, making four crossings. Later he served with the First Army in North Africa and died of typhoid in Italy in 1944. Whatever his limitations as a player, in sheer cricket spirit Ted Grace was a truly worthy member of the great family from which he sprang, and in Thornbury, where it was hoped that he would inherit his father’s practice and also the captaincy of the Cricket Club, his death at the early age of 28 is still deeply mourned. Cicely Grace – born in 1918. The photo of Cicely on the left was taken in 1932 at the time of Sally Grace’s (his cousin) 21st birthday. In 1946 Cicely married Dr Douglas Henderson who had moved to Thornbury in 1943 after qualifying in Belfast. Douglas joined the practice of Edgar Grace based in Park House before it later moved to 65 High Street. The marriage took place in Chelsea. They had two children: Elizabeth R born in 1949 and Edward D in 1951. The 1950 electoral register shows Cicely and Douglas living at Park House with her parents. By 1954 electoral register they had moved to Little Coppice in Kington. Dr Henderson died in 1968 and he is remembered in Thornbury through his name being used for the Henderson Ward in Thornbury Hospital in the 1970’s (note the other ward in the hospital was named Grace Ward after Edgar Mervyn Grace). Gerald Frederick Grace – born on 22nd March 1921. The photo of Gerald on the right was taken in 1932 at the time of Sally Grace’s (his cousin) 21st birthday. Gerald chose to serve in the Army. One record in the Second World War mentions him being a 2nd Lieutenant. In 1971 when he was awarded the O. B. E. he was a Lieutenant Colonel in the Royal Regiment of Artillery. We understand from the Crinfo website that Gerald carried on the family’s association with Thornbury Cricket Club. Gerald married Joan Elizabeth Salmon from Eastbourne on 13th October 1945. They had a son, Edward Michael (‘Mike’) born in Germany on 9th August 1947 and a daughter, Susan Patricia born on 18th May 1950. At some stage they moved to settle in the Gwent area. Joan died there on 13th May 1983 aged 66. Gerald married Diana Robinson in Monmouth area in July 1997. Gerald died on 2nd December 2004 in Monmouth. Lieut-Colonel Gerald Frederick Grace OBE – was born in 1921 and was named after his great-uncle, George Frederick, so as to retain the initials G.F. By a curious freak, however, he was always called Bill in the Army which he joined from School during the War and is now a Lieut-Colonel stationed at S. H. A. P. E.
Bill learnt his cricket at his father’s old school – Wrekin College where he was in the XI for 4 years, being captain for the last two. As an all-rounder he was often picked for his bowling, just short of medium pace with a very dangerous good length ball which drifted away from leg to off, taking many wickets against even very strong sides. He started playing for Thornbury at 13 and has always strengthened the side when on leave, scoring 3 centuries and capturing a large number of wickets. Saw service in the Korean War, being stationed at Hong Kong where he was very successful during their Cricket Centenary, while later in German he returned very good batting and bowling averages. In July 1948 he played for the Duke of Beaufort’s XI against Gloucestershire C.C.C. at the opening of the new ground at Badminton, together with such famous players at Arthur Mailey, Jack Fingleton, Bill O’Reilly, Alan McGilvray, Walter Hammond, Beverly Lyon, Brigadier M. A. Green, Bob Wyatt and Reg Sinfield. For the Army in an evening game in 1949 he took 8 wickets at a cost of only 2 runs, and claims that he once took all ten wickets – but not for T.C.C. Edward Michael Grace – ‘Mike’ was born on August 9th 1947 and won his cricket colours at Wrekin College in 1965 and afterwards at the Royal Agricultural College at Cirencester. He turned out for Thornbury during the summer vacation. The only son of Gerald Grace, and a great-grandson of E.M. he is a steady bat, who often opens the innings, his highest score so far being 71; his fielding is excellent and sometimes he keeps wicket.